UCANR electronic extension journal previously published as "Strawberries and Vegetables"
It's that time of year again when hot weather fuels the creation of ozone, or smog. Some pesticides emit volatile organic compounds (VOCs) that contribute to ozone formation. Using pesticides that release VOCs may be restricted in certain California locations between May 1 and October 31. 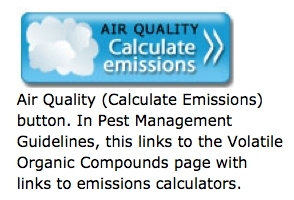 If you plan to apply a pesticide, use the Department of Pesticide Regulation's VOC calculators to determine emissions from fumigant and nonfumigant pesticides. Get there by clicking on the Air Quality button at the top of each treatment table in the UC IPM Pest Management Guidelines for strawberry and vegetables such as cole crops and lettuce. Use pesticides only when necessary. Decrease the amount of pesticide applied if appropriate. Avoid emulsifiable concentrate (EC) formulations and fumigants. Ozone, or smog, is caused by mixing VOCs, nitrogen oxide, and sunshine. High levels of ozone can harm people and crops. 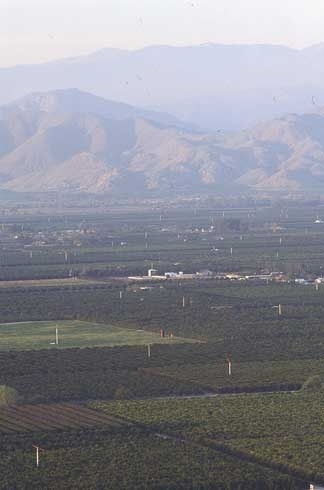 Regions in California that do not meet federal or state air quality standards for ozone, called nonattainment areas, may restrict the use of pesticides that release VOCs.